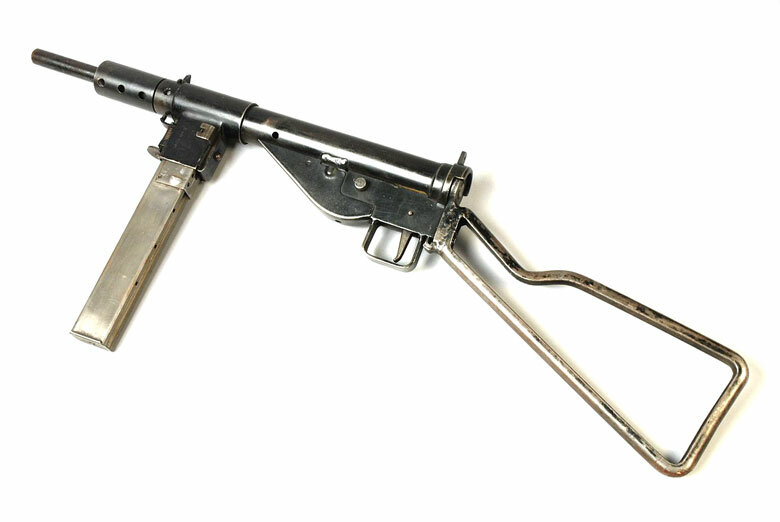 In the early days of World War II, the British developed a weapon that looked like it was bashed together by a plumber rather than a gunsmith. Looks were no matter though, as the Sten Gun soon earned its reputation for being deadly effective. In 1941, terrified Britons knew they didn’t have enough weapons to repel a German invasion force. The British lost thousands of small arms that were destroyed or simply abandoned after the devastating rout at Dunkirk. Bolt-action rifles from The Great War, or hunting guns were often the only firearms available for some units. The British Army purchased every Thompson submachine gun it could acquire from the United States, but once the U.S. entered the war, demand soon outpaced supply. It was at this point that two British weapons designers, Maj. Reginald V. Shepherd and Harold J. Turpin, worked together to create a simple, blowback-operated submachine gun that could be quickly and cheaply made from machined steel. The Royal Small Arms Factory at Enfield produced a prototype, the name of which came from the “S” from Shepherd, the “T” from Turpin and the “EN” from Enfield. You couldn’t blame the Tommies for calling the gun names. There were also questions regarding the reliability of the Sten Gun. Early versions had two annoying habits; jamming (common when the magazine lips were damaged or the weapon was dirty) or firing uncontrollably in full-auto when simply bumped or jostled. In fact, there are reports of soldiers later in the war who purposely threw a locked and loaded Sten Gun through windows so the weapon would start firing on impact. This would terrify and scatter everyone in the room before another Tommy kicked in a door. Produced in both Great Britain and Canada, the Sten Gun was often quickly welded together, the slag was filed off and the completed gun was then thrown in a pile with others of its kind. You couldn’t blame the Tommies for calling the gun names. The Sten Gun looked like it was assembled from bits and pieces found in a hardware store. In fact, some essential parts of early Stens, such as springs, were originally obtained from hardware manufacturers rather than gunsmiths. However, the Canadian weapons often had better production quality, with smoother edges and better tolerances. It took about five man-hours and 10.00 to to produce one Sten Gun, which is about $130 a weapon today, when accounting for inflation. The Thompson, which was the gold standard of submachine guns at the time, was beautifully made but exceptionally expensive. In today’s dollars, it cost an eye-popping $2,300 per weapon to produce. The Brits produced more than 4 million Sten Guns during World War II. In addition, partisan groups with access to machine shops often cranked out their own Sten Gun copies because it was so easy to make. The gun weighed seven pounds empty and nine pounds with a loaded magazine of 28 to 30 rounds. If kept clean and well-maintained, it could be an excellent weapon capable of devastating fire. Firing more than 500 rounds per minute (sometimes more, depending on the version) designers chambered the Sten for the 9mm Parabellum round, which was the most common pistol ammunition used by European militaries. When pressed, a stud allowed the gunner to select semi-auto fire as well. The choice of bullet was inspired. Users of the Sten Gun usually had no trouble obtaining ammo for it wherever they were, particularly if they raided German stocks of ammunition. Despite its ugly appearance and teething pains, the Soldiers of the King grew to trust and rely on the weapon. Lightweight, compact and concealable, it was often used by British airborne or glider-borne forces. “You wicked piece of vicious tin! Call you a gun? Don’t make me grin. You’re just a bloated piece of pipe. You couldn’t hit a hunk of tripe. 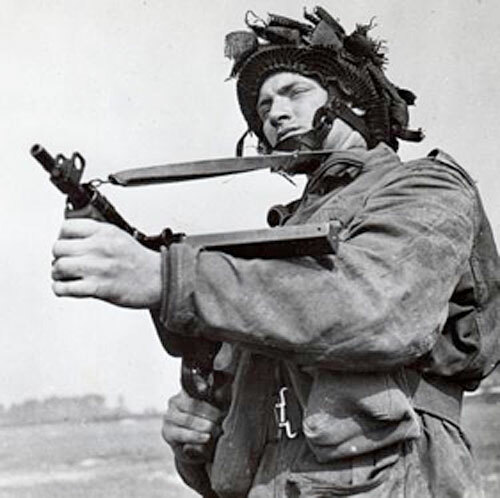 Alan Lee, a member of the Parachute Regiment during the war, said the weapon was best used for close-quarters combat. In a section of ten men in the Paras, Lee said the sergeant and corporal always carried a Sten gun, as did most of the officers. 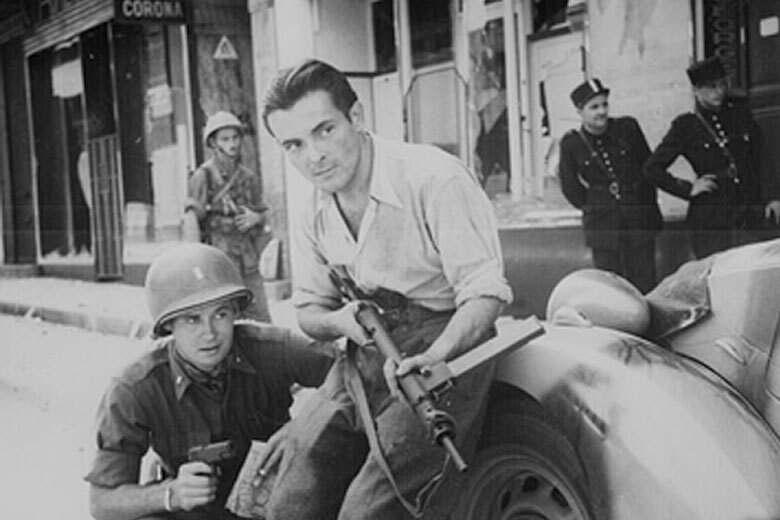 The British Special Operations Executive provided thousands of Sten Guns to partisan groups and resistance fighters as well. The weapons were distributed widely throughout Europe and the Middle East. In fact, Sten Guns were captured as part of al-Qaeda weapons caches in Iraq as late as 2010. The Sten Gun’s habit of jamming led to one of the messiest covert operations of World War II. 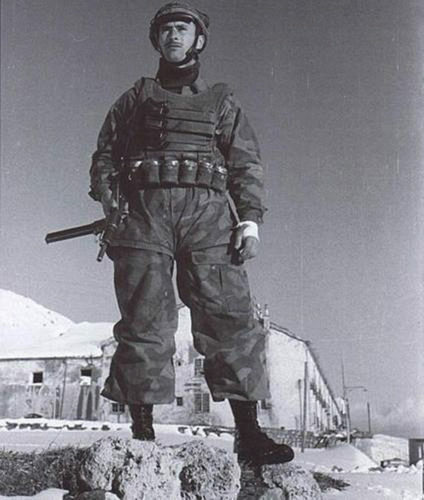 Czech agents trained and supported by the SOE carried Stens as their weapons during Operation Anthropoid, the mission to assassinate Reinhard Heydrich. Heydrich was the mastermind of “The Final Solution” and the SS Obergruppenführer that formed the special squads (Einsatzgruppen) responsible for the genocidal killing of Jews in Nazi-occupied territory and their deportations to death camps. Nicknamed “The Butcher of Prague,” he systematically wiped out Czech culture and the Czech resistance in an effort to “Germanize” the nation. 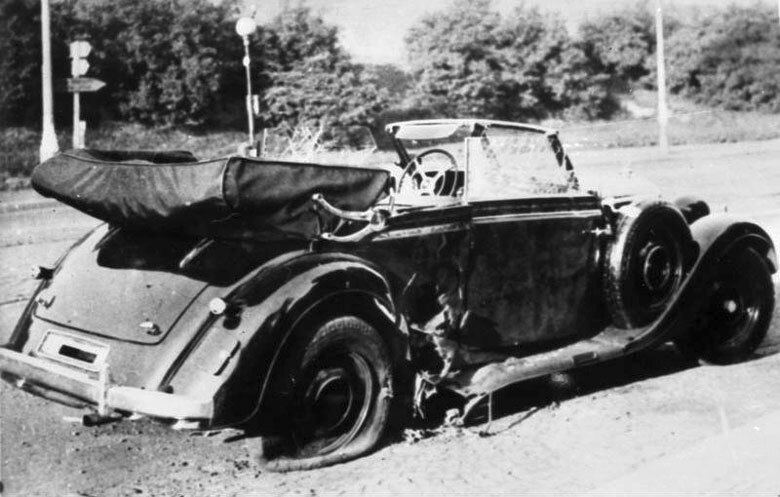 In 1942, as Heydrich traveled in an open-top Mercedes, a Czech SOE agent leveled his Sten Gun at the Nazi and pulled the trigger, only to have the gun jam without firing. The agent’s counterpart then tossed a grenade into the vehicle, horribly wounding Heydrich, who died a few days later of blood poisoning. Hated and loved, the Sten Gun was a workhorse submachine gun for British forces. Hastily contrived in the early, desperate days of World War II, it looked like a last-ditch effort to arm British troops. However, this ugly weapon worked (most of the time) and there were plenty of dead Nazis that proved the weapon through and through. Editor-in-Chief’s Note: Paul R. Huard writes about military history and military small arms for daily newspapers and online publications. He is based in Ashland, Oregon. The post Ugly But Effective: How the Sten Gun Became a WWII Workhorse appeared first on ITS Tactical.